Sphere of science: natural science, chemistry, physics, mineralogy, history, philology, optical devices and others. Lomonosov was also a poet. Mikhail Vasilyevich Lomonosov (November 19 [O.S. November 8] 1711 – April 15 [O.S. April 4] 1765) was a Russian polymath, scientist and writer. Lomonosov made important contributions to literature, education, and science. Among his discoveries was the atmosphere of Venus. As a scientist, he contributed to the fields of chemistry, physics, mineralogy, history, art, philology and optics, amongst others. 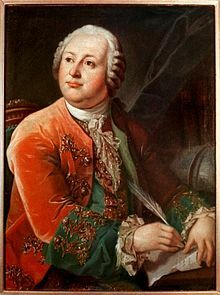 Lomonosov was also a poet, and influenced the development of the modern Russian literary language. This page was last changed on 4 November 2015, at 05:16.